We did a sweep of the Bear Pen Run loop. TheBear Pen Run Trail from the trailhead on the main entrance road up Bear Pen Run to North Boundary Trail to Buck and Doe, down the switchbacks to Bear Pen Run, then right returning to the trailhead. All was clear except for a 8 inch tree suspended about 20 inches above North Boundary Trail. More on frost bite. The trail passed Watoga Lake, now safely frozen solid. I observed an ice-fisherman very gingerly removing his gloves just long enough to bait a hook and drop it into the augured hole. This on a morning where the predicted high is 2 degrees F. And gusts of wind that will bring anything above freezing down to the freezing point in a much accelerated rate. The fisherman was of course being prudent. Frostbite was discussed in the trail report a few weeks ago in some detail. But it cannot be expressed enough how insidious this condition is. 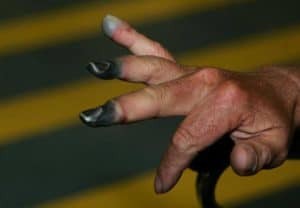 It does not take long, particularly in weather like we have been experiencing of late, for the most vulnerable body parts to be frostbitten. As a response to low temperatures the body shunts blood away from extremities. This prevents a drop in core temperature in the area around the heart, lung, liver and kidneys. Unfortunately those areas farthest from the core such as the fingers, toes and earlobes are at great risk. Blood flow in the extremeties is greatly reduced. It is important to reduce or eliminate exposure of bare flesh to extremely cold temperatures, and to keep these areas covered. To protect hands and fingers there is an advantage to wearing a mitten over a glove. Because a glove allows cold air to circulate between the fingers, the time to tissue damage is greatly reduced. 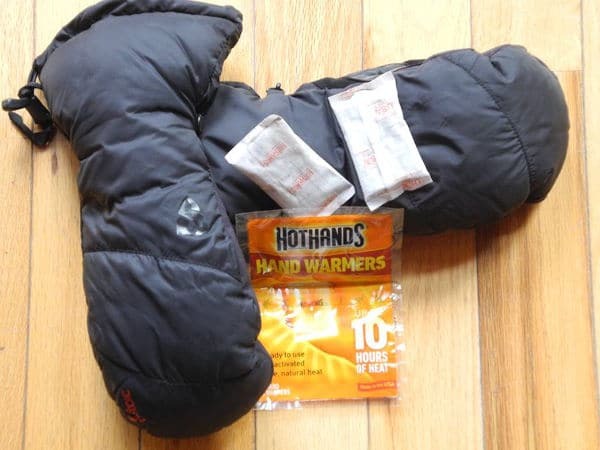 The warming pads help tremendously (pictured) and are quite inexpensive. We used these this morning and the fingers were warm for the entire 2 1/2 hours on the trail. The package did not exaggerate the claim that they stay warm for many hours. They are sitting here beside me and are still toasty some 6 hours later. It goes without saying that a warm hat that covers the ears should be worn in low temperatures. In addition to preventing frostbite it also helps prevent hypothermia because we lose a disproportionate amount of heat from the head and neck. Sometimes this is called “The Stovepipe Effect”. You don’t have to quit hiking in cold weather; just hike wisely. Attention was given to trails in the Arboretum on Tuesday and today the Mongaseneka Trail. Both trail systems are clear however Monongaseneka has just enough snow on it to make it slick with difficult footing in the steeper portions of the trail. 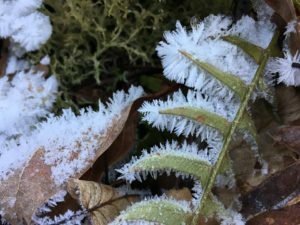 The continued single-digit temperatures this week require more preparation on the part of the hiker to stay warm, but ample rewards are to be found in the form of some beautiful and bizarre ice formations. There is no better trail to view these oddities than Dragon Draft which follows Two Mile Run. Be prepared for a total of 23 stream crossings, mostly on dry rock but with a few locations on ice. For your safety you should at least have hiking poles or a hiking stick to maintain your balance – ice creepers are very helpful as well. You can access Dragon Draft by parking at the Arboretum on the main entrance road. Dragon Draft, unlike the other trails in the Arboretum, offers a very moderate grade for its entire length. This is a family-friendly trail just keep in mind the current conditions of occasional ice. 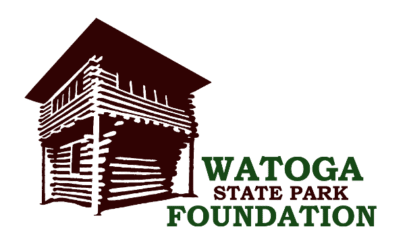 Happy New Year to all the folks in the Watoga State Park Foundation, all the trail volunteers, employees of Watoga State Park and those who love and visit Watoga State Park. I have long since quit making resolutions. But my New Year plans are to continue getting out on those Watoga trails every chance I get in 2018. For that I will be immensely grateful ! 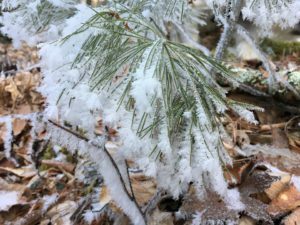 Today’s article is about hoarfrost. Today I had much appreciated help from the “other mountain state”, Colorado. The following trails are clear for hiking. In fact tracks in the snow reveal recent use. Jesse’s Cove Trail, Arrowhead Trail, Bear Pen Run Trail, Lake Trail and Recreation Trail. To delve a bit deeper into the formation of hoarfrost we need to look at the necessary environmental conditions. To produce any form of frost you need water in the form of a gaseous vapor and it must be suspended in the air over the ground that is at a temperature no greater than 32 degree F. Today’s temperature clearly met that requirement. 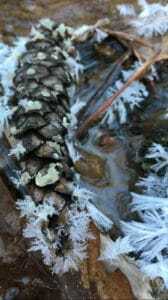 When these water vapor molecules come in contact with a subfreezing surface, such as a pine needle, they jump directly from a gas state to a solid state. This process, known as “deposition”, leaves a coating of tiny ice crystals that sometimes develop into these beautiful feathery forms as you see in the pictures. Now a word of advice to those who attempt to photograph these ephemeral sculptures. If you are being accompanied by a creature of the canine persuasion you would be wise to tie that critter off. While conducting your photography session, they seem to be drawn directly to the object of your attention. This often results in a paw coming directly down on your specimen of hoarfrost before the shutter is released. Believe me, I speak from experience. Bonnie, Busch Settlement, North Boundary, Buck and Doe and the completion of the loop on Bear Pen Run Trails were cleared of limbs and debris today. 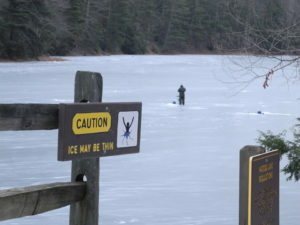 Well, the ice fisherman are back (pictured) in full force and they are after trout. I talked to 3 fisherpersons this morning and they report that the ice is 3 to 4 inches thick. The preferred bait for taking trout from under the ice is waxworms and Power Bait. According to outsideonline .com If your reading is at least four inches, proceed with caution. Ice more than five inches thick will likely hold a snowmobile, and ice more than eight inches thick will likely support a car or small pickup truck. I cannot attest to that personally so I am hoping our tenacious visitors venturing out on Watoga Lake are “proceeding with caution”. I did not consult the mercury-in-glass thermometer on my back porch this morning so I did not know when I headed out on the Bear Pen Run Loop the exact temperature in Fahrenheit nor Celsius, suffice it to say it was “plenty cold enough”. The rhododendron leaves in full droop and thin as a pencil whispered ” Even colder than that” as I passed by – I will take their word for it. Appropriately enough there were bear tracks on Bear Pen Trail this morning; a day or so old. It is likely on a morning this cold any bear with even a modicum of sensibility will be denned up somewhere. Coyotes and squirrels left their tracks here and there along the trail which is in quite good shape save for one 10 inch tree across the North Boundary Trail. Update on trail blockage of the GRT at MM 44: (pictured below) The trees and boulders blocking the Greenbrier River Trail approximately 1 1/4 miles downstream from the Seebert bridge was reported to Arthur and Dale this morning and they are going to cut the trees so that cyclists can get through, but the rocks will have to wait until next week when they can get the backhoe down from Droop Mountain State Park. Watoga-Leaks: There is an unconfirmed rumor of something being planned for the picnic area by the stables that will be of great interest to Watoga visitors, but my confidential informant had nothing further to say on that matter. I have it on good source though that Watoga Lake will be stocked with trout sometime in January 2018. If this weather continues they will have to cut a hole in the ice to get the wriggling fish in the lake. 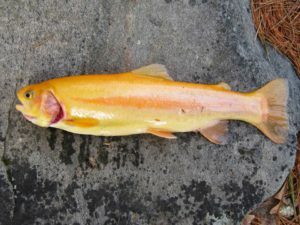 Among the trout there is expected to be some of West Virginia’s famous Golden Rainbow Trout, pictured below. Today the Allegheny Trail where it passes through the northern portion of Watoga State Park paralleling Chicken House Run Road was checked for hiking conditions. This section is admittedly seldom checked; there is a group that maintains the Allegheny Trail but it has been a few years since their last visit to Watoga. There are a number of trees down across the trail but it is all quite passable. When the Allegheny Trail leaves the park on this end of Watoga it spills the hiker onto the road for a short distance where it re-enters the woods of the Monongahela National Forest. My visitors, who are always conscripted for trail work, noticed that certain sections of the early morning forest floor were crunchy this morning. This is due in large part to a fascinating phenomenon called Ice Needles, pictured below. 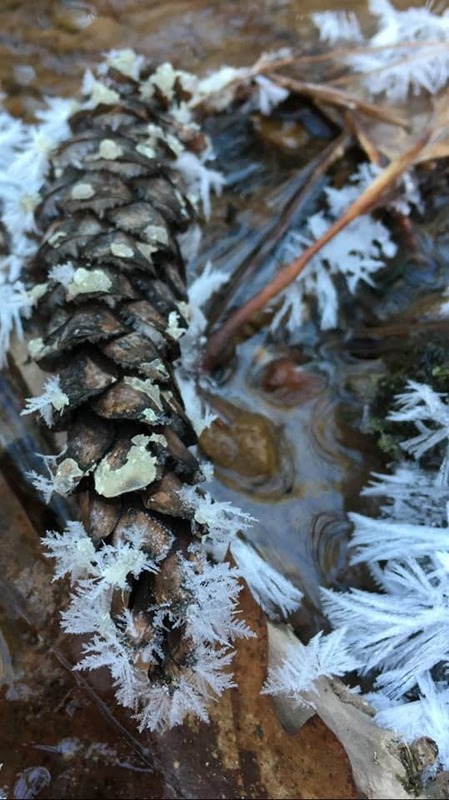 Ice Needles are just one of many strange and bizarre ice formations including hoar frost, rime frost and black frost. 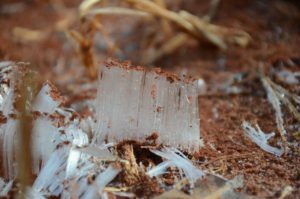 Ice Needles form, usually at night, when liquid water in the soil that is above freezing temperature comes in contact with surface temperatures below freezing. Crystals form in a pillar-like structure sometimes lifting soil and duff in what can be described best as hydraulic force. As noted by one of my guests, walking on Ice Needles is like walking on chandelier crystals. Having less class I would have compared it to walking on potato chips. Either is an apt description of the feel and sound of treading on these delicate ice formations on otherwise cold and quiet winter mornings.